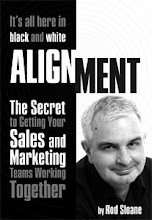 Sales and Marketing Alignment Blog from Rod Sloane: Getting Prospects to Believe in your Service Based Business. Getting Prospects to Believe in your Service Based Business. Are you a services or product based business? Even if you are a printer or landscaper and you produce stuff; I would suggest that it's your services that are likely to differentiate you from your competition. Aren't they? Those invisible things make all the difference? So how do you market the invisible? There's a much better ways to do this now. How about a podcast, where you make your clients the star of the show? How about a podcast for the association you belong to, where you make your fellow association members the star? I do this with Moving Voices for the Professional Speakers Association. How about posting a video on your YouTube Channel. This stuff is very low-cost and easy to do. Make your clients the stars of your marketing and people may start to believe more in you and your services.